Goa's climate is tropical, hot all year round, with a long dry and sunny season, which runs roughly from mid-October to mid-May, and a rainy season due to the south-west monsoon, more or less from late May to early or mid-October, and characterized by stuffy weather, cloud cover and frequent rains, which occur almost every day and are sometimes torrential. Goa, a former Portuguese enclave, is a small Indian state of 3,700 square kilometers (1,430 square miles) overlooking the Arabian Sea. The main cities are Panaji, Margao and Mormugao (where the main port is located). The coast of this part of India, which also includes the neighboring states of Maharashtra and Karnataka, is called Konkan. Given the numerous beaches, and the presence of a long dry season, here there are a lot of tourist facilities. In the inland areas, after a few dozen kilometers we find the first spurs of the Western Ghats, the mountain chain parallel to the coast. The highest point of the state is mount Sonsogor, 1,166 meters (3,825 feet) high. At this altitude you can expect about 7 degrees Celsius (12.5 degrees Fahrenheit) less than in the plains. From the mountains descend rivers fed by the monsoon rains, such as Zuari. The pre-monsoon period, from March to May, is the hottest of the year, and the temperature can reach 35/36 °C (95/97 °F), but it does not get as hot as in other parts of India. This partly happens also in the period following the monsoon, in October and November, when the temperature rises again and can reach 34/35 °C (93/95 °F). In winter, from December to February, the weather is normally hot and sunny. Here are the average temperatures at the airport, located on the coast. The monsoon in Goa is definitely intense, since the wet currents come directly from the sea: in July, almost one meter (3.3 feet) of rain fall. In July and August, the sky is often overcast, and relative humidity is very high, although the sea breeze gives a bit of relief. On the coast, rainfall amounts to about 2,900 mm (114 in) per year. Here is the average precipitation. The sun in Goa regularly shines in the dry season, while in the rainy season the sky is often cloudy, especially in July and August. From April to December Goa may be affected by tropical cyclones, with a higher probability at the beginning and at the end of the period (April-June and October-December). Cyclones in general do not directly hit Goa; however, they can bring heavy rains even if they pass at a distance, remaining on the sea, as happened with Cyclone Nilofar in October 2014. The Arabian Sea in Goa is warm enough for swimming throughout the year, as you can see in the following table. However, during the monsoon season the sea becomes rough and many beach facilities are closed. 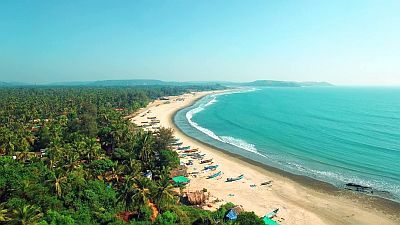 Within the dry season, the best months to go to the beaches of Goa are January and February: the weather is hot and sunny. In March, it's a little hotter, but generally not too much. In December, the weather is similar to that of January and February, but in theory a cyclone can still reach the area. In April and November, it's in the dry season, but it can get very hot, and a cyclone can affect this area. Especially from December to February, you can bring a light sweatshirt for the evening.